SR 600 from that intersection in St. Petersburg east to Lakeland, including mileage along the Gandy Bridge, Dale Mabry Highway and Hillsborough Avenue in Hillsborough County. 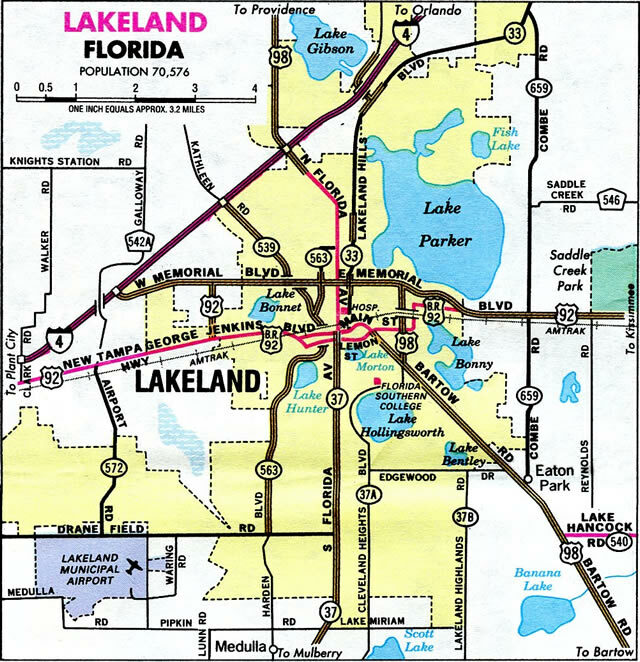 A brief deviation from SR 600 occurs in Lakeland, where U.S. 92 follows SR 517 north and SR 546 (Lake Parker Boulevard / Memorial Parkway) east. SR 600 (George Jenkins Boulevard) through Lakeland was previously designated as U.S. 92 Business. SR 600 resumes as the counterpart to U.S. 92 from east Lakeland (SR 546) to U.S. 441 in Kissimmee. SR 600 from DeLand east to Daytona Beach - a distance of 23.132 miles in Volusia County. U.S. 92 spends approximately two-fifths of its route merged with U.S. 17. The two highways share pavement between Lake Alfred and DeLand. Parts of the route through Orange County are known as the Orange Blossom Trail. Both U.S. 92 and its sole "child" route, U.S. 192, are located entirely within the state of Florida and are less than 300 miles long, so under the guidelines set forth by the American Association of Highway and Transportation Organizations (AASHTO), U.S. 92 and U.S. 192 should have been decommissioned. However, given the geography of the Florida peninsula, an exception seems warranted in order to allow east-west U.S. routes to serve the area. 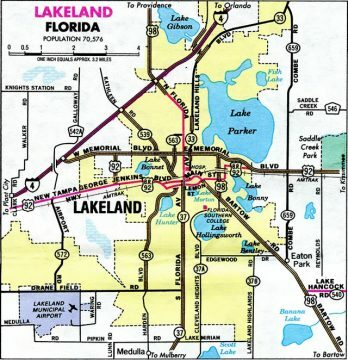 US-Highways.com indicated that the lone business route for U.S. 92 along Florida 600 was decommissioned in 1998, but many maps continued to acknowledge this urban route through the 2000s. Standing on the Friendship Trail bridge, the repurposed 1956-built roadway bridge for U.S. 92 across Tampa and Old Tampa Bays. This span was retained as a popular walking / pedestrian path from 1999 to 2008, when it closed due to structural damage, age and increasing upkeep costs. The bridge was subsequently demolished. Photo taken 11/20/03. Looking at the 1996-built westbound Gandy Bridge for U.S. 92 and the former Friendship Trail bridge from the eastern shore of Tampa Bay. Photo taken 11/20/03. "Bridges." Bayciti - Tampa Bay Urban Blog. Cozart, Justin, October 26, 2004. August 27, 2015. "Gandy is dandy." St. Petersburg Times, December 22, 1996. "Treasured Tampa Bay Link Shut." St. Petersburg Times, November 7, 2008.